And indeed, the 1016 was extremely understated. The watch has always looked positively mild-mannered, a horological Clark Kent belying its true “SuperWatch” nature – the nature of its namesake adventurers. There is even enthusiast speculation that the literary James Bond’s watch was actually an Explorer. Certainly his creator, Ian Fleming, wore one. We should point out; the Explorer reference 1016 is not the first Explorer. The early history – Rolex released the Explorer in 1953, around the time Sir Edmund Hillary and Sherpa Tenzing Norgay conquered Mount Everest with the help of Rolex Oyster Perpetuals – is a little murky. But those Oyster Perpetuals were the Explorer’s direct forefathers. 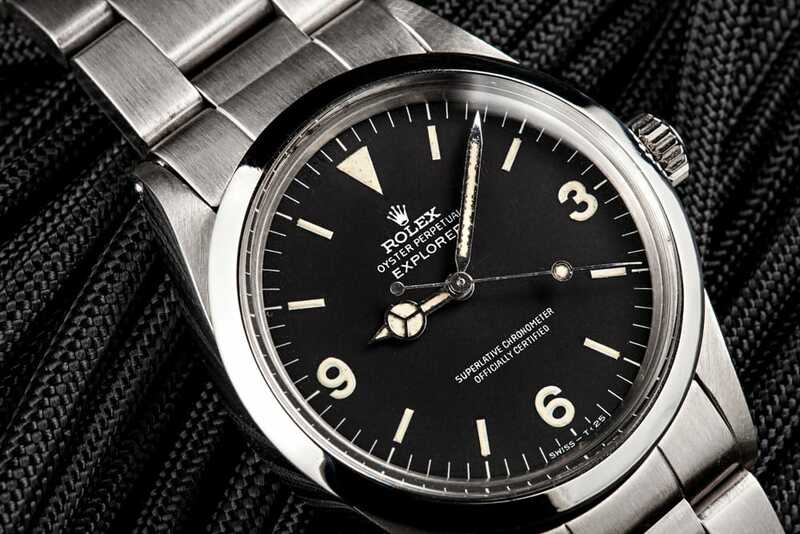 Rolex introduced the Explorer reference 6610 in 1959, bringing with it the Explorer as we know it today – the big inverted triangle at twelve o’clock and the large 3, 6, and 9 at their respective hour points on a black dial. 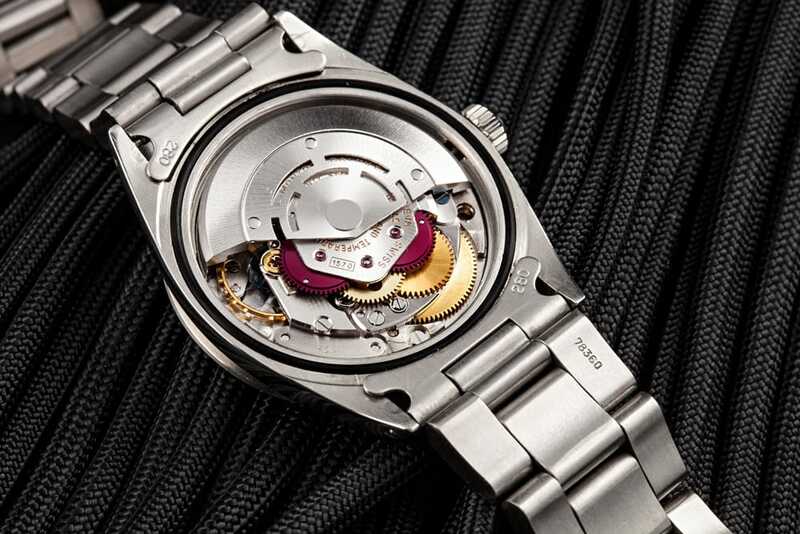 Rolex followed the 6610 with the 1016 in 1963, when it brought out a new movement, calibre 1560. The Explorer then remained pretty much unchanged for a decade. In the mid-1970s, Rolex upgraded the calibre 1560 to include a hacking feature, and gave it a new designation: calibre 1570. The Oyster bracelet was upgraded to solid links at the same time. Both upgrades were effectively invisible, and the Explorer 1016 carried on. Rolex continued their trademark minor evolutionary upgrades all the while. Indeed, the Explorer 1016 carried on until 1989, when it slipped from the catalog with no advance notice. The new and improved Explorer reference 14270 – applied numerals and hour markers, larger case, and new everything else – appeared six months later. The current Explorer, ref. 214270 (descended directly from the 14270) has been current for some time. And following Rolex’s aforementioned gradual, evolutionary upgrading, the watch this year received bright blue Chromalight lume in its applied white gold numerals, joining the lume in the rest of the dial’s hour points. New, broader hands are present as well, improving readability even more. The 39mm case is water resistant to 100 meters, and is still modestly sized compared to its visibly sportier brethren, the Submariner, GMT-Master II, and Daytona. The 904L steel Oyster bracelet is secured with Rolex’s Oysterlock safety clasp, which features their patented Easylink extension mechanism. And so the watch that descended from those hardy timepieces used by Sherpa Tenzing and Sir Hillary is still a formidable piece of kit. Able to hold its own in the most extreme circumstances in the remote outposts of the world, it looks just as much at home peeking from under a French cuff in the boardroom, or coupled with a chambray shirt and jeans on a flea market weekend.